The Uists and Barra are amazing islands - there really is nowhere else like them in Scotland! Bursting with wildlife and totally dominated by the ever present Atlantic, these really are Islands on the Edge! This holiday provides a fantastic introduction to these unique islands. The many lochs and lochans of North Uist and Benbecula - the east side of these islands contain more freshwater than solid land! Flower rich machair, all along the west coasts of the islands. The most astonishing concentration of ground nesting birds anywhere in Britain. The unique Gaelic culture of the Uists. The beguilingly small and intimate scale of Barra - and, of course, its amazing airport, where scheduled flights take off from and land on a cockle beach! 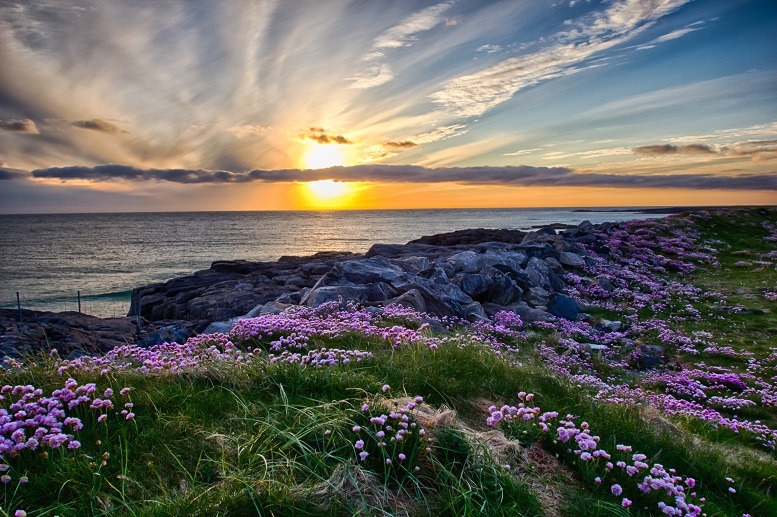 The Uists and Barra are a world apart and a holiday exploring these beautiful islands is a unique experience - even visitors from mainland Scotland often feel like they are visiting a foreign country when they come here! The Uists are made up of 6 main islands (Berneray, North Uist, Grimsay, Benbecula, South Uist & Eriskay), all of which are connected by road causeways, along with countless large and small uninhabited off-shore islands. Seen from the air, this is an astonishingly watery world - North Uist and Benbecula in particular appear to consist mostly of freshwater lochs, with the sparse population clustered in a few coastal villages. Great views of this watery landscape can be had from the small hills of Beinn Langais on North Uist and Ruabhal on Benbecula. All the islands have countless beautiful beaches to explore at your leisure, their silver strands set off perfectly by the famous turquoise seas of the Hebrides. Behind the beaches lie large machair meadows, covered in wildflowers during the summer and home to huge numbers of ground nesting lapwings, redshanks, oystercatchers and other wading birds from May to June. Barra is a tiny island with a unique character all its own. Reliant on fishing it has always looked to the sea. Even more laid back than the Uists, Barra is many people's favourite Hebridean island. The pace of life is very relaxed on all the islands and you will find local people very friendly and happy to pass the time of day with you. Gaelic is frequently heard in shops - this is part of Scotland's Gaelic heartland, and the language is still widely spoken. Whilst everybody speaks English, if you take the time to learn a few Gaelic phrases you will get a great reception! Dates: This self guided holiday can run at any time during the year. How long: 7 days / 6 nights (longer or shorter trips are also available). Base: 2 nights on North Uist, 2 nights on South Uist or Benbecula, 2 nights on Barra, staying at comfortable guest houses / B&Bs. Price: From £599 per person, based on two people sharing a twin / double room. Includes all ferry fares (based on car + 2 passengers). Additional days: £50 per person. Below we have added a suggested itinerary for this holiday. This would make for a fantastic week long tour of the Uists and Barra. However, as part of your self guided package you will also receive comprehensive information on other walks on each of the islands, plus ideas for alternative outdoors activities and things to do if you fancy a day off from walking, or if the weather isn't great. Treat the itinerary as a starting point, and amend it as you wish! Day 1. Travel to Skye and take the ferry from Uig to Lochmaddy in North Uist. Visit the gorgeous little island of Berneray at the northern tip of the Uists. Day 3. Visit Balranald Nature Reserve on the west side of North Uist where there is an excellent coastal walk. Look out for many rare birds along the way, including the elusive corncrake and corn bunting, both of which can often be heard singing from near the visitor centre. Visit Barpa Langais, an impressive stone age burial chamber before climbing the small hill above for wonderful views over North Uist. Drive to your next B&B / guest house in Benbecula or South Uist. Day 4. Climb Ruabhal, a small hill but the highest point on the otherwise very flat Benbecula, for more great views of the watery Uist landscape. Visit Howmore in South Uist and its beautiful ancient chapels and burial grounds before enjoying a stroll along part of the vast silvery beach that runs almost the entire length of the island. Day 5. Drive to Loch Eynort where some excellent trails give a taste of the mountainous east side of South Uist. This is a great place for spotting white tailed sea eagles if you are lucky. Continue on to the little island of Eriksay and enjoy an excellent walk along its beaches and coastline. Take an evening ferry to Barra and drive to your next guest house / B&B. Day 6. Explore the remote Vatersay peninsula, visiting pristine beaches and an evocative deserted settlement, with amazing views to a whole series of once inhabited but now empty off-shore islands. In the afternoon head to the airport to watch the only scheduled flights anywhere in the world that take off and land from a beach! Day 7. Take the ferry from Barra to Oban. Standard accommodation is in good quality island B&Bs and guest houses. All rooms have either ensuite or private bathrooms. If preferred, we can arrange accommodation at island hotels. Langass Lodge and Hamersay House in North Uist are excellent, with comfortable rooms and wonderful food. Lochboisdale Hotel and the Pollachar Inn provide good accommodation at the south end of South Uist, whilst the Castlebay Hotel is an attractive base for exploring Barra. Accommodation can be arranged at any of these hotels for an additional cost (the exact surcharge will vary - some are more expensive than others). The grade of this holiday is Easy / Moderate. Most walks are relatively short and none should take more than half day. Most walking is close to the shore, either on beaches or the grassy machair fields. There are a couple of very small hills (Ruabhal, for example, is less than 400ft above sea level!) but these are well worth the effort for the wonderful views they provide. The walk on Vatersay crosses some rough moorland in places. A full set of Ordnance Survey 1: 50,000 maps for the Uists and Barra. Walking guide book for the islands. Detailed holiday pack including all the information you need for a memorable stay in the Hebrides. The pack includes information on many of the best walks on the islands, advice about the most interesting places to visit, the best cafes and restaurants, public transport information - and lots of tips and advice to help you get the most from your holiday. What's Not Included: Evening meals - we will provide you with information on the best places to eat out on the islands; packed lunches - these are often available at the B & B's; travel insurance. Can I make the holiday longer / shorter? Yes! Just tell us how long you would like to spend exploring the islands and we will put together a customised itinerary for you. Additional days can be added to the standard itinerary for just £50 per person. When is the best time to visit? May and June are traditionally regarded as the best months for visiting the Hebrides, but any time of year can be good. April and September / October can be particularly good - the low sun highlighting the beautiful colours of the heather cloaked hillsides.